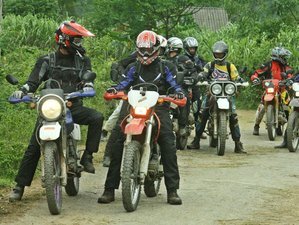 The crossing-border motorbike adventure tour through Laos and Vietnam is certainly a special experience. Along this 2,000-kilometer trip, Vietnam on Trails will introduce to you the hidden North East of Laos and the spectacular mountain landscape of the Northwestern Vietnam. This trip can be customized for 7, 8, 9 or 10 days. During the tour, you will stay at several accommodations including a homestay, guesthouses, and hotels. You will be picked up and transferred to the starting point where you will take the bike and start the first-day ride to the northwestern of Hanoi. There will be easy paved trails and main roads, nice scenery along the Da River, and bamboo forest. Have dinner and overnight at a homestay with a Thai family. Say goodbye to the family and head down to Thanh Hoa province. Ride on a beautiful trail along the Ma River until Nameo Town where you cross the border to get to Laos. The landscape suddenly changes in Laos side with quiet road and nice scenery, riding up and down many mountain passes. Have dinner in town and overnight at a mini guesthouse in Xam Nuea. It's a nice day ride over many hills and mountain passes. Visit some small Hmong villages on the way. Before arriving in Xieng Khouang, you will make a visit to the famous Plain Of Jars. Have dinner in town and overnight at a hotel. Start early as you have a long day ride today. It's still very hilly all the way to Luang Prabang. There will be some stops for a photo of very nice view over high mountains and deep valley. Arrive late in the afternoon. Have dinner in town and overnight at a hotel. The whole day is free time to discover the ancient city of Luang Prabang, a nice city with lovely food and plenty of things to visit. Meals are by your own and overnight at the hotel. Leaving the beautiful city of Luang, you head up closer to the northwest of Vietnam, another long day but beautiful, with many stops to visit the villages of Hmong and Thai people. Have dinner and overnight at a guesthouse. Head to the east where you will cross the border to get back to Vietnam. The landscape changes quickly once after the border, flat plain with rice fields and tree lines. Ride all the way down hill through the country of Thai people until the spectacular valley of Dien Bien Phu where you will stop for the night. Have dinner in town and overnight at a hotel. Make a visit to the historical remain of French battlefield during the Indochina War. Start riding down to the south to get to Son La. Ride up and down many high passes with many stops on the beautiful Pha Din mountain pass for a photo and visit to the village of Black Thai / Hmong people. Have dinner in town and overnight at a hotel. Keep riding down the hill to get the bank of the Da River then riding along the Hoang Lien high mountain range until the valley of Phu Yen. Have dinner in town and overnight at a hotel. Leaving the high mountain of the northwestern region, you head down to the south to get back to Hanoi and follow the bank of the Red River until Hanoi. You end the ride in Hanoi. This motorcycle tour will start and end in Hanoi, Vietnam. Your journey will cover several places including Mai Chau, Dien Bien Phu, Son La, and Phuyen in Vietnam as well as Xam Nuea, Xieng Khouang, Luang Prabang, and Muang Khoa in Laos. Book your flights to arrive at Noi Bai International Airport (HAN). You can also book the tour for 8 to 10 persons at the cost of 1,100 USD per person. Kindly send an inquiry.